This coffee cake is delicious plain or take it up a notch by adding whipped cream and more toasted almonds and it is fit for a queen. Serve it as a dessert or for brunch, either way you will please the taste buds. In a medium sized bowl beat butter and 3/4 cup sugar on medium high until light and creamy. Add eggs, sour cream, and extracts and stir until well blended and the batter is smooth. Whisk together dry ingredients except cinnamon and mix just until combined. In a small bowl whisk together remaining 1/4 cup sugar and cinnamon. Spread 1/2 the batter in a greased 10" round spring form pan. You can use a square pan. Top with half the peaches and sprinkle half the sugar cinnamon mixture over peaches. Spread remaining batter over peaches and arrange the remaining peaches in a uniform pattern and sprinkle with remaining sugar cinnamon mixture. Bake in a 350º oven for 1 and 15 minutes. Check cake if it's done at 55 minutes. 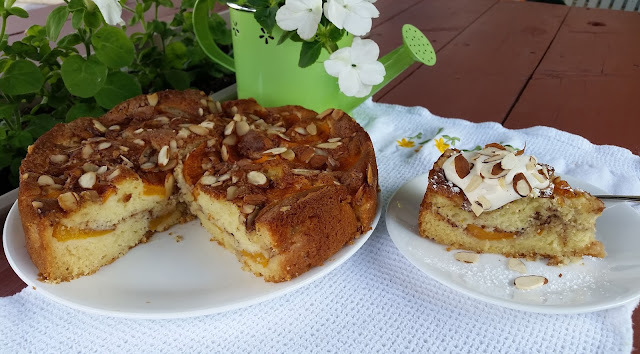 Sour Cream coffee cakes are my all favourite and this one looks like a winner!!! So pretty baked in a spring form pan. If I use fresh peaches could I get back on the sugar? You could try cutting back on the sugar especially if your fresh peaches are quite sweet although I didn't find this cake overly sweet. Is it Peach time? I've seen the hard-as-a-rock US peaches but not Canadian yet. When they do come in, I like to slice them and freeze for some day in January when I'm feeling sorry for myself. Best pick-me-up ever! Love peach anything..Can I substitute almond yogurt for the sour cream? My granddaughter is allergic to anything dairy. June in Canada..as long as the texture of the yogurt is the same as sour cream I'm sure it would work.